Okay so I&#39;m starting one of (what I hope to be) four large centerpieces for my groups new gaming table. 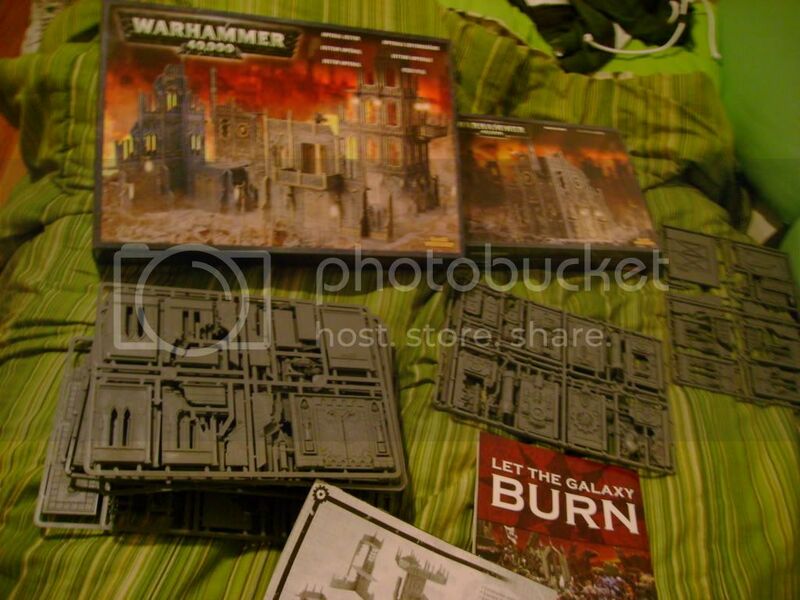 For the first one I&#39;ll be constructing a foundry that has fallen into disrepair and recently come into use by the Emperor&#39;s Children and Thousand Sons. The bulk of this piece will be made with the City Fight buildings on a Masonite base. I was wondering if any here has assembled the city fight terrain GW sells? and if they have any pointers. I have a manufactorum and a sanctum imperialis. I&#39;ve used some of the sprues for incorporating into foamcore buildings but I haven&#39;t built a complete kit with them. As for advice, use clippers and not a hobby knife to cut them off the sprue. Its thick as hell and a pain to cut with a knife. Also cutting the doors to buildings so they can open seems like a cool idea but is not near as easy as it should be. Overall I think they are great kits and I plan to build some more buildings with them for my CoD table but I prefer using them in combination with other materials rather than using them as a stand alone terrain piece. I&#39;ve built the Sanctum and the Administratum building, and I&#39;m quite pleased with how easily the parts glued together- I was able to get the bulk of the Administratum building done in one morning. In a way, the walls reminded me of the old LEGO castle walls. You WILL need clippers, as well as a good amount of plastic glue. There wasn&#39;t much flash on the "faces" of the walls, but you might want to watch the flash on the edges to insure the walls meet up properly. Your idea of a Masonite base is EXACTLY what I did, and it turned out very well. You might want to plan out your building on paper in advance, as there may not be enough floors/walls for what you want to get done- For a 4-sided Administratum building, I had to raid a second box of Cityfight ruins. As for painting- USE SPRAYPAINT for the base coat (Probably black, in the case of a foundry). Then pick out the dtails/drybrush as desired. Thanks for the replies, I&#39;ll have to wait a little while to build them though.